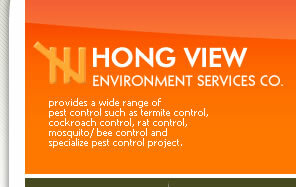 Hong View Environment Services Co.
control such as termite control, cockroach control, rat control, mosquito control, bee control and specialize pest control project. We are member of Pest Control Personnel Association of Hong Kong (PCPA). The pesticide is safety, environmental friendly and strictly chosen. The revolutionary odourless technology also make the pesticide fresh and safe. All pesticides had been approved by Hong Kong Agriculture & Fisheries Department. We also purchased a professional Compression Sprayer, Thermal Fog Applicator and Electric Sprayer from foreign country. With our specialist expertise and well experience, Hong View Environment Services Company is well positioned to provide value to customers in the area of cost saving, improved efficiency and flexibility.